A perfect gift for the bride-to-be! Ideal for wedding cakes, or any other special occasion dessert that needs slicing and serving. 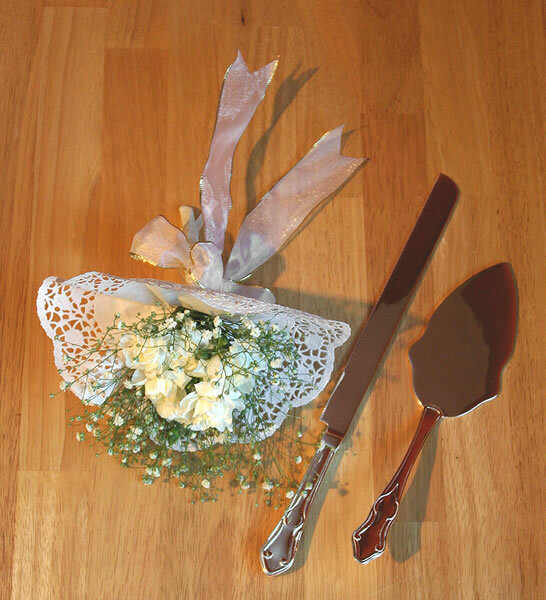 Our traditional flatware design set includes both the cake knife and the cake server. Cast of solid brass with a heavy silver plating, which is treated with an anti-tarnish finish to help prevent tarnishing, so the set can retain it's shine for years to come. This traditional flatware design makes a graceful statement on any dessert table, and is ideal for use with wedding cakes in particular. Both beautiful and functional, our cake knife sets are all made of solid brass with a heavy silver plating which is treated with an anti-tarnish finish to help maintain it's shine for many years. While all silver plated items are treated with a finish to help prevent tarnishing, please note that periodic wiping with a soft cloth is still necessary to keep these items shining. Oxidation, which requires polishing, will occur over time.